Counters are numeric data variables that can be added to a document. 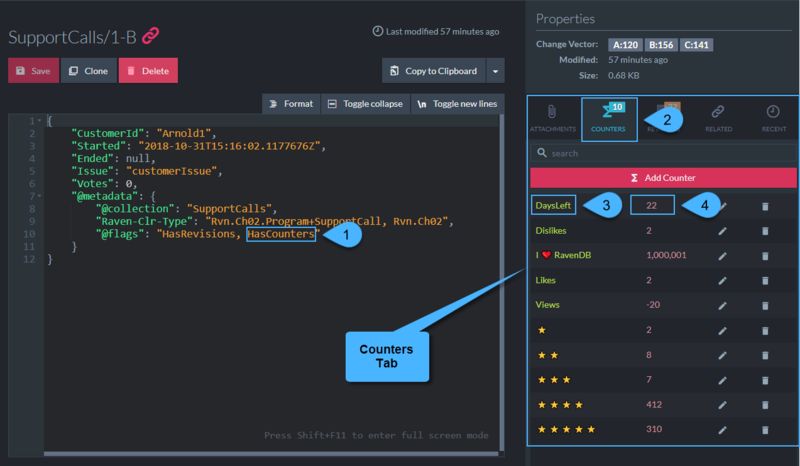 Create and manage Counters using API methods or through the Studio. To view counters data, open the document they belong to. 2. The Counters Flag indicates which documents currently have counters. 4. Counters' details are located in the Counters Tab. indicating whether a document has Counters. Click the header to open the Counters tab. The current number of Counters is stated on the header. You can use whatever characters you choose, including Unicode symbols. 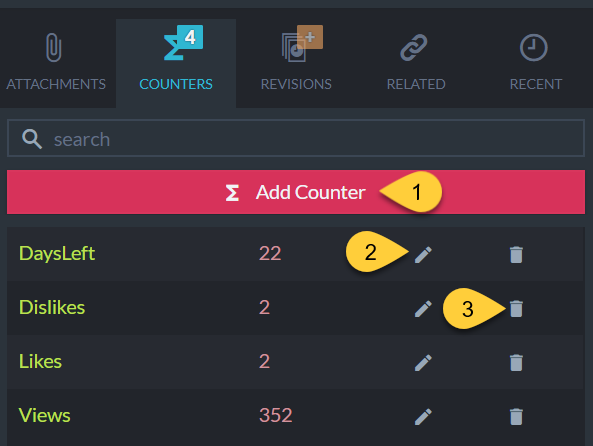 Add, Modify or Remove Counters from the Counters Tab. 1. Click "Add Counter" to create a new Counter. 2. Click the Edit icon to modify a Counter's value. A. Counter's name - Note: Once set, the name cannot be modified. B. Current value - The accumulated value from all nodes. C. Enter a new value here. This value is the acculated value, see note below. D. Confirm to carry out the update or Cancel. 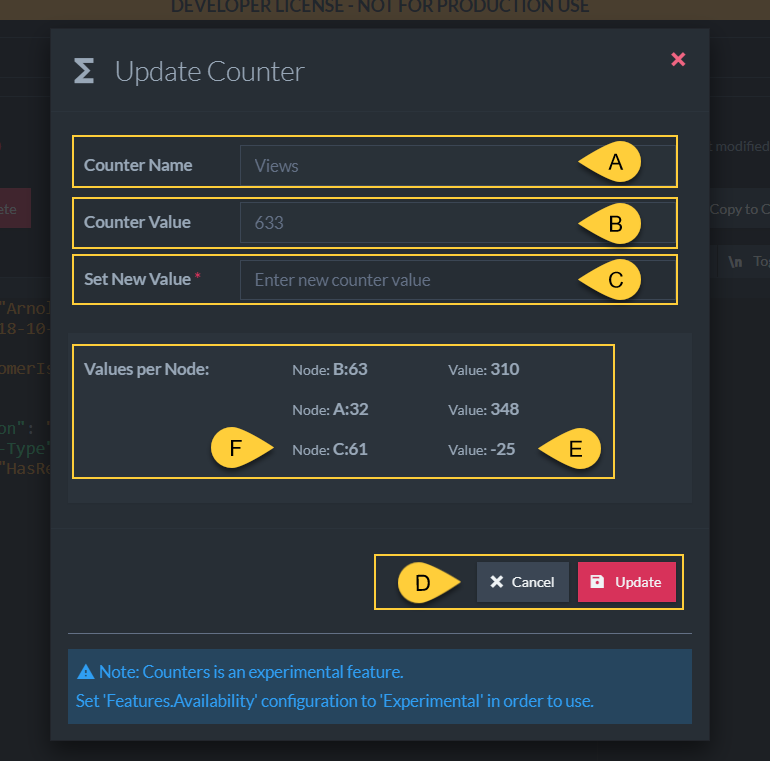 E. The Counter's value per cluster node. 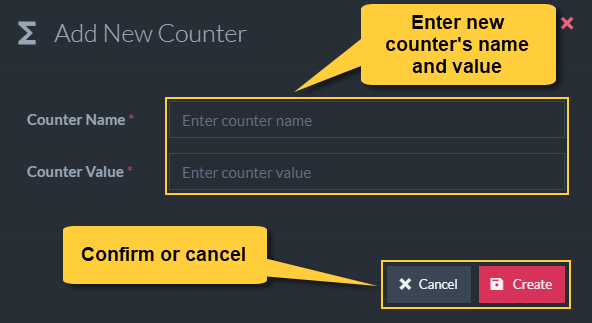 Modifying a Counter's value sets its accumulated value. making its accumulated value 633. Setting the new value to 700 from node A, will change its accumulated value to 700 by setting its value in node A to 415. A Counter value can be negative. 3. Click the Delete icon to remove a counter. 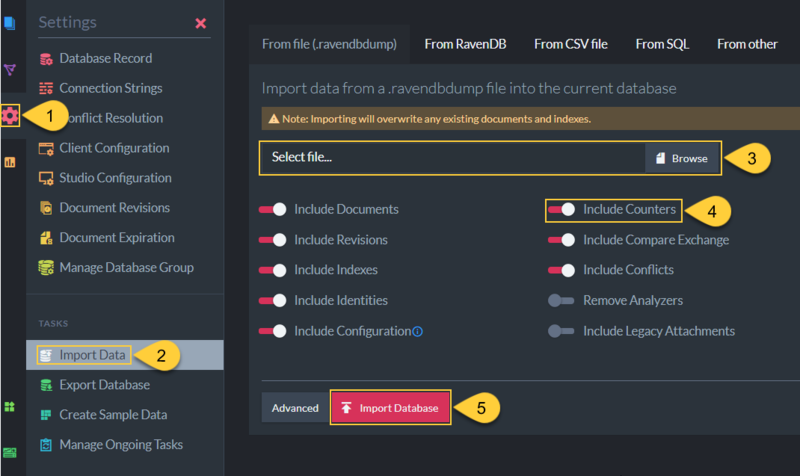 You can Export selected components, including Counters, into a file, and Import them into your database when required. 1. Click the Settings gear. 3. Use the default name or enter your own. 4. Select the components you wish to export. Make sure Counters are included. 5. 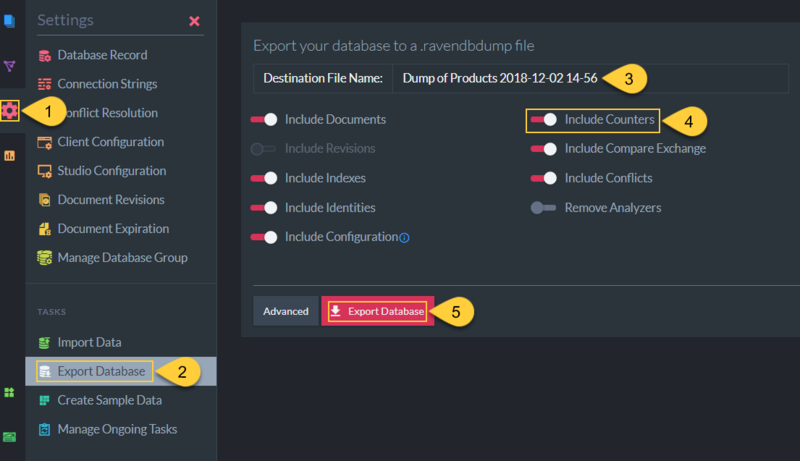 Click to export the database. 3. Select a file you wish to import from, or another source. 4. Select the components you wish to import. Make sure Counters are included. 5. Click to import the database. Remember that Counters are not independent entities. You can import a Counter with its document, or into an existing document. 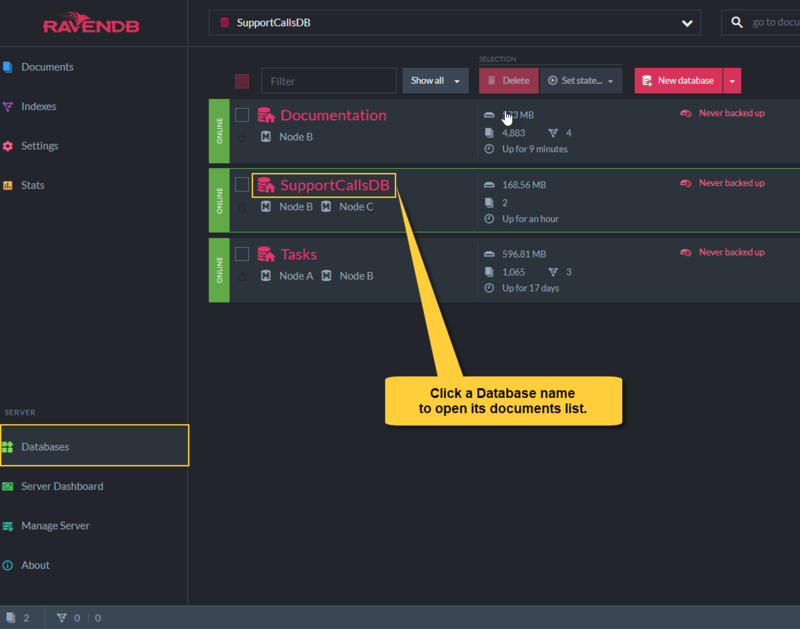 Check "Include Documents" and "Include Counters". This will import documents along with their Counters. Check "Include Counters" but not "Include Documents". Verify that a document named products/1-C already exists in your database. The Counters will be imported into products/1-C.